Inglis Barracks was a military installation in Mill Hill, London, NW7. Also was referred to as Mill Hill Barracks. Inglis Barracks was built in 1904. The site was roughly triangular in shape bounded by Partingdale Lane to the north, Frith Lane to the east and Bittacy Hill to the west. It was a short walk up the hill from Mill Hill East tube station. The rail service was originally built by the Edgware, Highgate and London Railway (EH&LR) and had been opened as Mill Hill by the Great Northern Railway (GNR). The barracks became the Regimental Depot for the Middlesex Regiment (Duke of Cambridge's Own) when they moved from the Hounslow Barracks following the opening of the barracks. The barracks were named after Lieutenant General Sir William Inglis, who had commanded the 57th (West Middlesex) Regiment of Foot during the Battle of Albuera, one of the bloodiest battles of the Peninsular War (1809–14), fought on 16 May 1811. All of the recruits for the Middlesex Regiment were processed through the Regimental Depot at Mill Hill during the First World War. The barracks ceased to be the home of the Middlesex Regiment when that regiment merged with three other regiments to form the Queen's Regiment at Howe Barracks in Canterbury in 1966. A Royal Electrical and Mechanical Engineers Workshop moved onto the site in 1943 during the Second World War. The Home Postal Depot, Royal Engineers (HPD RE) established their Postal Training School (PTS) in the barracks in the mid-1950s. By 1962 the HPD RE had moved from its premises on Gorst Road, Acton, to fully occupy Inglis Barracks. The Postal Depot’s main sorting facilities was established in an old munitions factory off Frith Lane and barrack buildings were given over to accommodate administration offices and sleeping quarters. On 31 October 1962, shortly after the occupation of the barracks by HPD RE, Her Royal Highness The Princess Mary, Princess Royal and Countess of Harewood, as the Controller Commandant Women's Royal Army Corps (WRAC) laid the foundation stone for extra barrack blocks  to be built within the site to accommodate 12 Company, WRAC. The company provided postal staff employed in the Home Postal Depot and clerical staff, who worked in the various War Office (later Ministry of Defence) departments in London. Once the building works were completed the company was moved from their accommodation in Richmond Park, London to the barracks. On 16 July 1982 Queen Elizabeth II, visited the Home Postal Depot (or the Postal & Courier Depot as it was then styled) as part of the RE (Postal & Courier Services) centenary celebrations. On her arrival at the barracks she was met by Vice-Lord Lieutenant of Greater London, General Sir Hugh Beach and the Chief Royal Engineer, Lieutenant General Sir David Willison. During the course of her visit she unveiled a statue, was escorted around the Sorting facilities by the Director Defence Postal & Courier Services, Brigadier Don London OBE and the Commandant Postal & Courier Depot RE, Colonel Rolf James, attended a luncheon in the Officer's Mess and a tea party on the lawns. To mark the centenary Barnet Borough granted the Depot the Freedom of the Borough. The Provisional Irish Republican Army planted a bomb in one of the barracks blocks (Block B) its explosion in the early hours of 1 August 1988 killed Lance Corporal MJF Robbins and injured nine other soldiers of the Royal Engineers. The two storey building containing the single men's quarters was completely destroyed. The Prime Minister, Margaret Thatcher, subsequently met officers to offer her condolences as the barracks was in her then Parliamentary constituency. In April 1993 the responsibility for the processing of the armed services mails addressed to HM Ships and British Forces Post Office (BFPO) addresses was transferred from the Royal Engineers to the newly formed Royal Logistics Corps. To mark the occasion a parade was held at the barracks. The Chief Royal Engineer General Sir George Cooper inspected the troops and took the salute. The British Forces Post Office (the successors of the Home Postal Depot RE) left the site and moved to RAF Northolt in 2007. The original barrack installation constituted two accommodation blocks, an officers mess, a small church and various out buildings. Other buildings were added over the years, particularly in the 1960/70s, to accommodate the growing establishment and changing use. The military presence at the barracks ceased in 2007 and the site was sold by the Ministry of Defence for residential development as part of Project MoDEL in 2012. The estate is now called ′Millbrook Park′. In the 1970s the road names within the barrack's complex reflected the presence of the RE (Postal & Courier Services). On 30 July 2018 one of the roads on the Millbrook Park development was named "Michael Robbins Way" in honour of the death of Corporal MJF Robbins on 1 August 1988 in the IRA bombing of B Block. Outside the Officer's Mess there stood the Middlesex Regiment's memorial, but that has since been moved to Mill Hill village near to Mill Hill School. The memorial was unveiled at 2.30pm on 4 November 1922, by HRH The Prince of Wales (the late Duke of Windsor). Sixty years later the Duke of Windsor's niece, The Queen, unveiled a life-size statue entitled Letter from Home, which stood outside the Guard Room, on her visit to the barracks in 1982. The statue was moved to RAF Northolt when the barracks were vacated by the British Forces Post Office (the successors of the Home Postal Depot RE) in 2007. The statue depicts a First World War soldier (a 'Tommy') reading a letter and is a replica of the statue by sculptor Charles Sargeant Jagger (1885-1934) which stands on Platform 1 at Paddington Station, London. The statue was simply called Soldier Reading a Letter and was erected as a memorial to the men and women of the Great Western Railway who lost their lives during the First and Second World Wars. ^ a b "Mill Hill East". 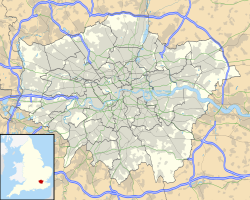 London Borough of Barnet. Archived from the original on 8 November 2014. Retrieved 8 November 2014. ^ "Disused Stations: Mill Hill East". Retrieved 2015-04-26. ^ Osborne, Mike (2011). "Defending London: A Military History from Conquest to Cold War". The History Press. ISBN 978-0752479316. ^ "Military history of barracks inspires new Taylor Wimpey Development". Millbrook Park. Retrieved 8 November 2014. ^ "The Queen's Royal Surrey Regiment". Surrey County Council. Retrieved 8 November 2014. ^ "Inquiry into Army Girls' behaviour". The Glasgow Herald. 28 August 1967. Retrieved 29 August 2015. ^ "Picture Gallery." Times [London, England] 17 July 1982: 1. The Times Digital Archive. accessed 28 August 2015. ^ "Memories of a military man". Hendon & Finchley Times. 28 June 2010. Retrieved 29 August 2015. ^ Weinraub, Bernard (2 August 1988). "I.R.A. Bombing in London". New York Times. ^ "I.R.A. in London: Decade of Violence". New York Times. 8 February 1991. ^ "Remarks visiting Finchley". Margaret Thatcher Foundation. Retrieved 29 August 2015. ^ "Posties lower the flag". PCS Branch Royal Engineers Association. Retrieved 31 August 2015. ^ a b c "History". Millbrook Park. Retrieved 8 November 2014. ^ "War hero remembered at new development". Taylor Wimpey. 9 August 2018. Retrieved 3 December 2018. ^ "Letter from Home". PCS Branch Royal Engineers Association. Archived from the original on 24 September 2015. Retrieved 29 August 2015.